On June 6th of this year, the New York Times Magazine published a long and gruesome article on generations of sexual abuse perpetrated by male teachers upon male students at the exclusive Horace Mann School, in Bronx County, New York. The abuse happened long ago — there was no whisper that anything of the kind had occurred lately — and the abusers were all dead. From the article, they appeared to be generally awful people. One person whom almost no one seems to believe is especially awful is 88-year-old Buddhist and former Horace Mann English professor Tek Young Lin, who went unmentiond in the original article. He was, according to a followup published today in the Times, deeply beloved by his students. He also slept with several of them, and admits it. "It seemed O.K. in those days," he told the Times. The man said that Mr. Lin used phrases like “I just want to cuddle” and that Mr. Lin would not do anything he did not want him to do. The above-quoted student's relationship with Mr. Lin, according to the Times, lasted "years," though their contact was only very rarely sexual. 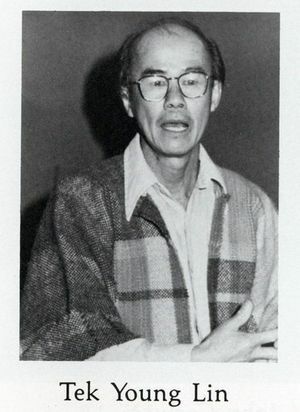 All three students cited Mr. Lin as a positive influence in their lives, even today, and seemed reluctant to speak, not wanting to hurt the reputation of a man who had opened their eyes to philosophy and literature, and whose strict grammar rules they remembered today. … [Mr. Lin's] Zen-like presence in a notoriously non-Zen-like environment offered students a unique outlook on the world. Long after Mr. Lin retired, some alumni started a Facebook page,“Fans of Tek Young Lin,” and many kept in touch with him. … During the interview last week, Mr. Lin said he was now traveling the country to try to reunite with the nine surviving members of his World War II battalion. … [Mr. Lin] said he now understood that he might have crossed a line. It's a fascinating story, and my synopsis does justice to neither the Times profile of Mr. Lin nor their original reportage on Horace Mann. Please check it out.